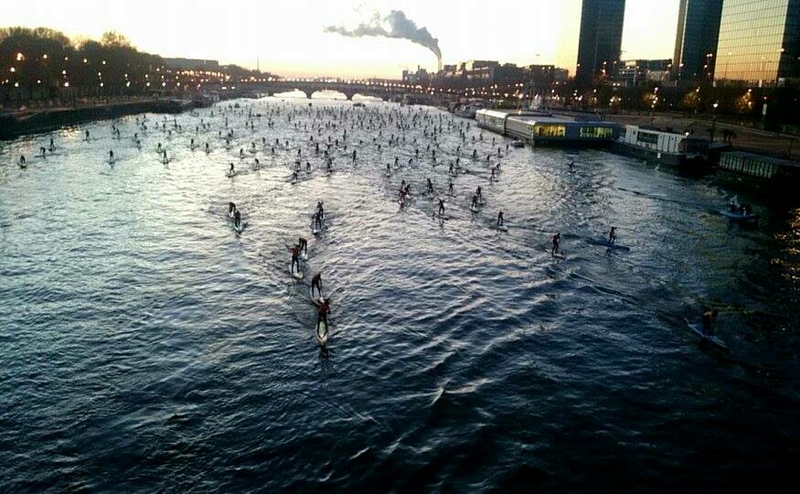 Titouan Puyo, Casper Steinfath and Celine Guesdon have dominated the 2014 Paris Crossing, as a record 400 stand up paddlers invaded the iconic River Seine on Sunday. In what will surely go down as the single biggest race of the year, Titou won the distance event while Casper took the pool sprints and the overall title. The main event, the iconic long distance race that includes a passage right by the Eiffel Tower, started just after dawn on a crisp but clear winter’s day in the French capital. Right from the start Titou and Casper broke away and were never challenged. Kai Lenny started strong but clearly wasn’t in his element, unable to keep the pace of the main chase pack that was being led by French SUP stalwart Gaetan Sene. Post by NAUTIC SUP PARIS CROSSING. Gaetan eventually paddled home on his own, finishing just 18 seconds behind Casper and over 2 minutes clear of 4th place. This is a great result for Gaetan, who is known as a river expert and would have been in his element on the Seine. Multiple winner of this event and long-time French #1, Eric Terrien, fought hard with Leonard Nika, while the promising junior Martin Letourneur was also looking very impressive. Our man on the ground, Alain Teurquetil (known as the designer of Travis Grant’s signature NSP boards), was sending us regular updates and photos as the race happened. Sounds like it was a two-horse between Titou and Casper all the way. Despite Titouan being much better known for his downwind abilities, the New Caledonian powered through the flat water race, eventually breaking Casper in the latter stages and going on to win by 1 minute 34 seconds. That’s an amazing performance in what was a very classy field of elite talent. Alain said Titou looked incredibly powerful as he surged along the River, past several of the world’s most iconic buildings. This win in Paris caps off a remarkable year for Titou, with today’s trophy sitting alongside the distance race world title from the ISA Worlds in Nicaragua. The result also sees Titou jump one spot higher on the SUP RACER WORLD RANKINGS, in what will surely be the final change in order before the end of the year. The pro women’s field was considerably smaller (8 finishers vs 63 in the men’s) but still included some strong talent. The strongest of which was France’s Celine Guesdon, who powered home to win the race from Joanne Hamilton-Vale and beat the majority of men while she was at it. In addition to the pro field, there were over 300 in the open race (or “Leisure division” as the French call it). There was also the unique sight of competitors paddling in full-length wetsuits. For safety reasons wetsuits were mandatory, as it was near freezing cold in the air (6 degrees Celsius / 42 Fahrenheit) and probably even colder in the water. However the day wasn’t done with the distance race, with the top 20 men’s finishers (and top 4 women) qualifying for a specialty event that afternoon. The Paris Crossing is part of the “Salon Nautique” international boat show – one of Europe’s biggest marine events – and inside the huge exhibition pavilion, paddlers raced up and down a 20 metre pool on what is perhaps the world’s smallest SUP race course. In this do-or-die, knockout-race-format, it was the young Danish Viking who stood tall. Casper survived a series of challenges to progress through to the final, where he eventually defeated Eric Terrien. This gave Casper the overall Paris Crossing title and shows the exceptional versatility of this young champion. Casper’s win in the pool also saw him leapfrog Eric Terrien and Beau O’Brian on the World Rankings. Casper, Beau and Eric are now locked in a very tight battle for the minor placings inside the top 10, with just 2.30 points separating the trio. The distance race and pool sprints were counted as separate races in the World Rankings (see explanation below). The Paris Crossing appears to be a truly grand event and from all reports the paddlers loved it, despite the freezing conditions. The course sees competitors traverse the iconic River Seine – including a section that goes directly by the Eiffel Tower – in what is a once-a-year opportunity (the river is usually closed to paddlers due to heavy boat traffic). In fact this race is so in-demand that all 400 spots sold out within hours and even the waiting list was running into the hundreds. Organisers plan to increase the limit by several hundred next year and eventually want to have 1,000 paddlers on the start line. That would truly be a sight to behold. If you want to reserve your spot for the 2015 Paris Crossing, be on the lookout for registration openings around September next year. This year’s entries sold out within 10 hours, so we’ll give you a solid heads up before registration opens to make sure you don’t miss out. Anyway we’ve got the full results below and there are plenty of cool photos up on the official Facebook page. Given the elite talent on display, this event has qualified for the SUP RACER WORLD RANKINGS with a Race Index score of 18% (just above the minimum qualifying threshold of 15%). If you’ve been following our WORLD RANKINGS since they were released two months ago, you’ll know that every race in the world is analysed to see if it qualifies for the system. Each race receives a unique “Race Index” score from 0-100%. It’s a complex algorithm but the basic answer is: The more elite competition that’s racing, the higher the Race Index score. Or in other words: The harder a race is to win, the more points you get for winning it. Right now there are 27 races counting towards the men’s world rankings, which now includes results from the Paris Crossing (at least for the men – the women’s race did not qualify). Each paddler’s best 5 results from the past 12 months count towards their ranking points. Though a small note: The Paris Crossing is essentially two different races – the main event is the Paris Crossing itself, aka the Long Distance Race, while there is also the specialty event, the indoor pool sprints. For the SUP RACER WORLD RANKINGS, I’ve treated each event as a separate race. The event did award overall titles (to Casper and Celine respectively) based on combined results, however I’ve chosen to look at each race separately. That’s mainly because only a certain amount of paddlers (top 20 men, top 4 women from the distance race) were competing in the Sprints, so it would seem wrong to rank some paddlers based on 2x events and some paddlers based only on 1x. It’s a bit of a grey area but I decided the fairest way was to separate this event into two different races, even if it does give a slight advantage to the guys who performed well in each discipline. You can view the current Top 100 ranked men in the world on the full SUP RACER WORLD RANKINGS page. Interestingly, the Paris Crossing was the second event in two days to qualify for the World Rankings, with the highly-competitive King of the Cut race in Perth earning an identical Race Index score of 18%. Several competitors from both of those races made their debuts in the Top 100, including a couple of guys that jumped over 300 places. At the pointy end of the rankings, Gaetan Sene was the biggest mover, jumping 33 spots to now be ranked #31 in the world. Martin Letourneur, Peter Bartl and Roman Frejo also all moved into the Top 50 for the first time. With several paddlers receiving their second rankings result on the weekend, the One Race Club has dwindled down to just four members. This club is reserved for paddlers that are ranked inside the Top 100 in the world despite only having competed in 1x eligible race (meaning they’re carrying 4x donuts in their best-five-result total points). Results from the weekend (Paris Crossing + King of the Cut) will almost certainly be the final change to the rankings before the end of the year. However there was actually one other change on the weekend, with results from last year’s Paddle Royal race in Puerto Rico dropping out of the system. Events are only held in the rankings database for 12 months before being discarded, as the SUP RACER WORLD RANKINGS uses a rolling 12-month system, similar to pro tennis. The infamous 2013 Paddle Royal event was held 12 months ago to the day and, due largely to the failure to pay the advertised prize money, did not return this year. So if you’re wondering why some paddlers dropped several places despite not racing on the weekend, that’s why. Click here for the raw results from the “Leisure” divisions.